Dental bonding is a term used to describe the application of tooth colored materials to repair or enhance front teeth. The procedure gets its name from the fact that white dental materials are actually bonded to the teeth. Unlike cosmetic dental procedures using porcelain, this can be accomplished in one visit. This patient called us frantically after having broken her front tooth. She couldn’t bear to even leave the house to come see us. This woman from Milford broke her tooth. She left 45 minutes later back to normal. Photos and dentistry Dr. Nicholas Calcaterra. 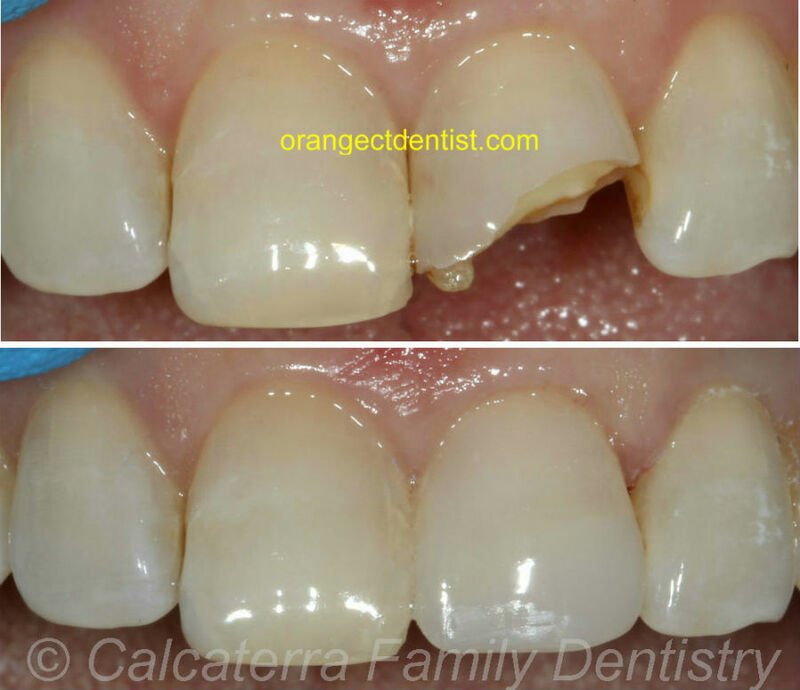 We were able to fix her front tooth with bonding in such a way that she could barely tell which tooth was fixed! This patient had braces on for nearly four years. With braces on for such a long time, white and brown spots can develop, even with diligent brushing, mouthwash use, and flossing. After four years of orthodontics combined with less than ideal home care, the top photo shows what she looked like when the braces came off. We fixed it with bonding – as seen in the lower photo. Photos and dentistry Dr. Nicholas Calcaterra. The results speak for themselves. While we would have preferred that the discoloration not develop, were able to give her a solution. In one visit, we brought her back to her original looks using bonding. This patient was very unhappy with the gap between her two front teeth. The formal name for that gap is a diastema. Before and after photos of bonding on a patient from West Haven, CT. The patient wanted the gap between her front teeth closed. 45 minutes later it was done! Case and photos by Dr. Nicholas Calcaterra. We discussed all of her options with her and then collectively decided cosmetic bonding was the solution. In one hour, she walked out with a completely changed smile! 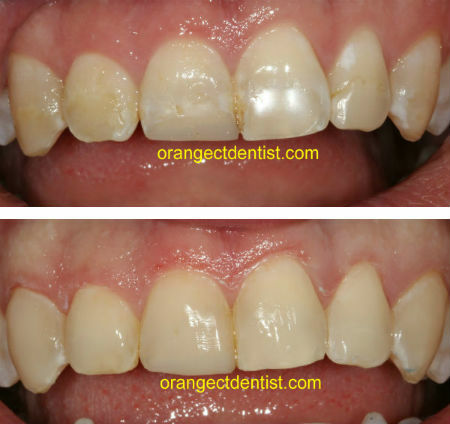 Before and after photos taken on a patient from Woodbridge, CT. Porcelain veneers were discussed but the patient wanted it completed in one visit. Case and photos by Dr. Nicholas Calcaterra. To close gaps between teeth, such as the one above or the dreaded “black triangle”. To repair chips or actual cracks in front teeth. To correct discoloration or stained teeth. To address dental decay (also known as cavities). The concept of bonding is also used in white fillings. In white fillings, the decay is removed and white filing materially is bonded into the tooth. Learn more here about white fillings. With porcelain veneers, we have to remove some tooth structure to allow appropriate room for the porcelain. In bonding, you have to remove much less. Bonding can be accomplished in one visit, while porcelain veneers and all porcelain crowns are completed in two visits. 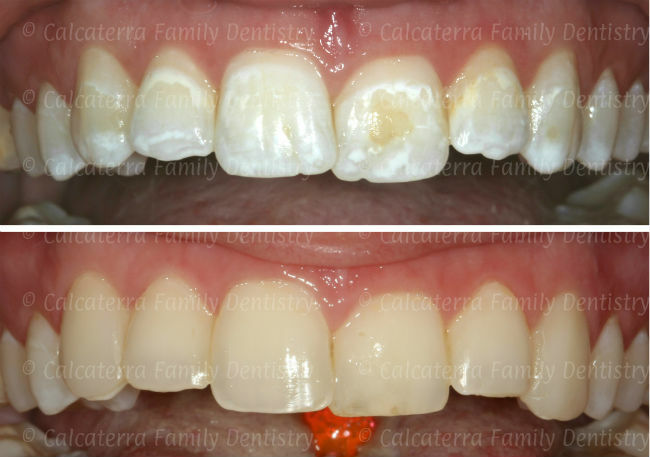 In porcelain solutions, we can add key features such as more translucency, white spots, mamelons, or other features that can’t be done reliably with bonding. Bonding is less durable than all porcelain crowns and veneers. All porcelain solutions will generally cost more than bonding. We will always discuss your individual case with you as there are always unique aspects for each person’s smile. Call us if you have more questions about bonding at our office.